House QM answers the building regulations in a different and "twisted” way. House QM is a single family house situated in a new allotment that exists out of square plots of the same size, with the same building regulations; houses must recoil 5m of every side of the terrain, have 2 levels and must have a flat or sloped roof. This results in similar looking two-story houses as an extrusion of the square building zone. combination of orientation, privacy and views." This “twisted” implantation improves the spatial qualities inside and outside. Three different garden zones were formed; the driveway and carport, the intimate garden on the side of the bedrooms and the more active garden on the south-west. The rooms downstairs are entirely closed to the South and the North, also maximizing privacy. They are oriented to the East, the home office to the West. In the intimacy of the axil/internal angle is the main garden, where residents enjoy the garden from noon to night. On the upper floor both facades in North and East are completely closed, so that the residents avoid viewing from the allotment and the street. The kitchen and the dining room are completely open to the south, creating a broad view over the roofs and gardens with the countryside in the distance. A large canopy covers partially an even larger terrace, providing the necessary shading according. An external staircase brings you from de terrace straight to the garden. The vertical canopy has a large opening directed to the garden in the West; enabling interaction between the terrace and the garden below. The lounge looks towards the west to catch the light of the evening sun and ends on a shorter balcony with ditto canopy. 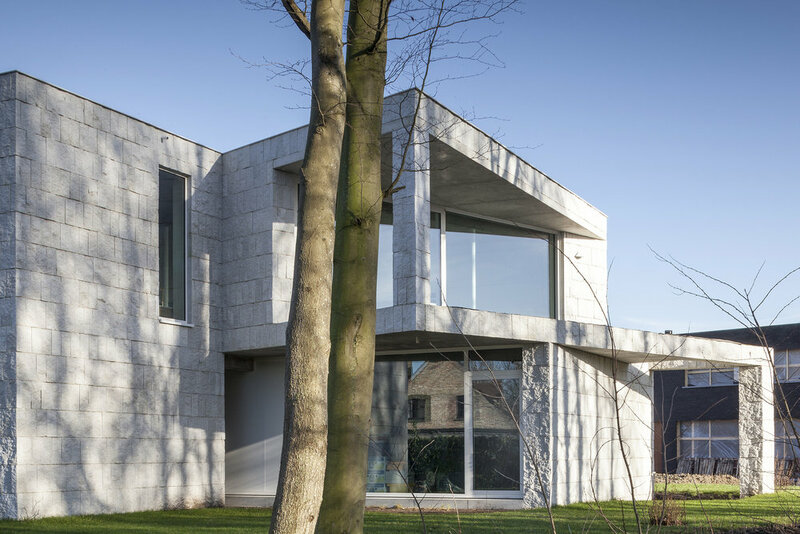 A large format cleaved concrete block was chosen as the façade material. The blocks are typically used in larger industrial or public buildings. The glued bond of the big blocks plays with scale. giving the whole an estranging effect." The ceilings are fair-faced concrete, the floor a poly-concrete. Even with a continuous use of the same architectural elements, the building dynamics completely alter from various angles. "By simply walking around the building, one can immediately feel the expression change." House QM, a family home in Gistel, Belgium, looks like an architecturally realized version of one of MC Escher's paradoxical illustrations. The home has a unique, angular displacement that gives one the impression of a twisted rectangular column — an impression very intentionally fostered by the studio behind the project, Office O Architects. Though visually captivating, House QM's Escher-esque design has a practical purpose. Because of strict zoning laws in Gistel that require houses' walls to be within five meters of their plots' edges, most of the family houses in the area tend to look nearly identical. Office O Architects created their twisted structure to adhere to those zoning laws while still looking visually unique and offering the residents alternate views of the landscape compared to all the other abodes.